Jonathan is a GP living in Pewsey. He graduated from Aberdeen University in 1990 and spent six years undertaking surgical and GP training before joining the Royal Flying Doctor Service in Australia and then formal Emergency Medicine training in Queensland until returning to the UK in 2000. Jonathan then spent the following 12 years as a partner at the Marlborough Medical Practice. He is married to Sophie & they have a son Youssef. Jonathan is the Chairman and one of the Medical Trustees of SWIFT Medics. Ed is a Consultant in Emergency Medicine in Newport. He lives in Corsham with his wife Leah, two young children and two cats. Ed grew up in Somerset, graduated from Southampton University Medical School in 2002 with a particular interest in pre-hospital care. 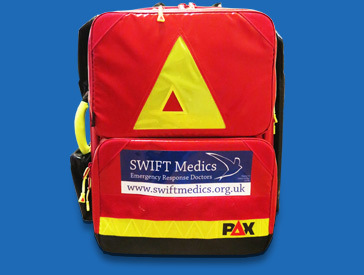 Ed is very keen to help develop the pre-hospital service offered to the people of Wiltshire by SWIFT Medics. Philip is a GP who qualified in medicine at Bristol in 2009, concurrently qualifying as a Paramedic. He has 15 years of experience working in pre-hospital care, initially as a first-responder and latterly as a BASICS doctor. Philip lives in Colerne and works in Oxfordshire as a Medical Officer. Philip is married with two children, is involved with his local church and enjoys climbing and hill-walking when he gets the time. Scott is a trainee in Anaesthesia, Intensive Care Medicine and Pre-Hospital Emergency Medicine in Bristol. He graduated from Imperial College School of Medicine in London in 2007 and moved to the South West in 2009. Scott’s interest in pre-hospital care began at medical school. He joined Great Western Air Ambulance as a volunteer doctor in 2013 and completed his Pre-Hospital Emergency Medicine training with them in 2015. James has been a Consultant in Paediatrics and Neonatal intensive care for more than ten years and is a full time retrieval consultant / clincal lead for the NEST (Neonatal Emergency Stabilisation and Transfer) team based in Bristol which covers Gloucestershire, Somerset, Wiltshire and Bristol. He is also a Critical Care Doctor on the Great Western Air Ambulance. When James isn't in the back of an ambulance he likes to spend time at home with his wife and two small children. James is very keen to help develop the pre-hospital service offered to the people of North Somerset and Bristol by SWIFT Medics. Jules is a Consultant in Emergency Medicine at the regional Major Trauma Centre at Southmead Hospital in Bristol. He graduated from Bristol University in 2002, and trained initially in anaesthesia and then Emergency Medicine. Jules has worked for Great Western Air Ambulance team since its initial formation in 2007 and flies regular with the service. He is medical director for Run Bristol (Bristol 10K and Half Marathons) and is a crowd doctor for Bristol City and Bristol Rugby clubs. Jules is married with two children and lives in the Bradley Stoke area of North Bristol.